Disney World is home to many wonderful shows that could play to a packed house on Broadway and every Disney fan has their favorite show and you can find information about many of the shows here on My Dreams of Disney. Personally, my favorite part of all the Disney movies and shows is the music which probably explains my passion and appreciation for Festival of the Lion King. The Festival of the Lion King is in the Camp Minnie-Mickey section of Animal Kingdom. The show is shown in air-conditioned comfort in a “theater in the round”. There are four sections and each is named after a specific savanna animal (specifically a giraffe, a warthog, an elephant and a lion). Before the show, each section will be given a chance to practice their animal noise (if you haven’t seen the show, you may not even know that giraffes make specific noises) which they will be called upon later in the show to join in with. The show begins with the arrival of costumed singers that “lead” each of the four animal sections. All of your favorite songs from the Lion King movie are presented along with dancing, a bird ballet and my favorite – acrobatic monkeys. The jumps and tumbles of the monkeys entertain and thrill everyone in the audience. A word of warning, Scar and the hyenas make an appearance during the show (they perform the song “Be Prepared”) so if your child is frightened by Scar in the movie, you may want to prepare your child for this eventuality. It’s not too long and you shouldn’t miss out on the show for this one small part. There’s a grand finale but I don’t want to ruin the surprise so you will need to check out this show. 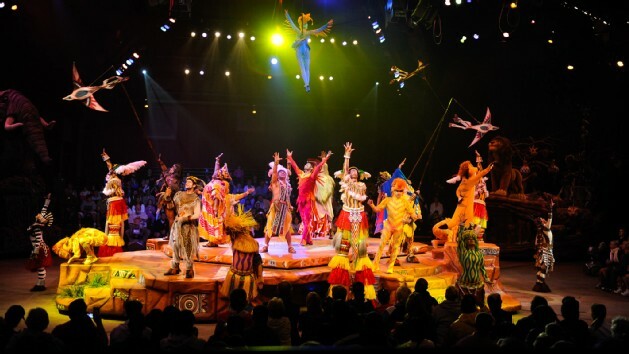 So, when you are visiting Disney’s Animal Kingdom, take a break from the rides and excitement to take in Festival of the Lion King. Bonus, Camp Minnie-Mickey houses many character interaction areas so your little ones will be able to visit with some of their favorite Disney characters before or after the show.